In the city of Laalvur, magic is viewed as nothing more than superstition. Though the occasional strange child is branded Unbalanced and abandoned for the priests of the Balance to raise, actual magic exists only in stories. So Ev, the daughter of a thornfruit seller, has always believed; but Ev has a passion for stories. When a chance encounter with Alizhan, an enigmatic runaway, gives Ev the chance to act like a hero, she takes it, forming a curious friendship with the silent girl by passing her stolen thornfruit. Raised in secrecy, Alizhan both causes and experiences pain whenever she touches anyone other than her foster-mother, the powerful Iriyat. Though Alizhan is faceblind, unable to read or interpret facial expressions, she reads the minds of everyone around her, using her power to steal secrets from Iriyat’s rivals. Her only friend is Ev, the girl she sees in the market. In a decade of quiet association, they’ve never once spoken aloud to each other—but when Alizhan learns something about Iriyat that shakes her faith in her patron, it’s Ev she turns to, and Ev who helps her. Why do the Laalvuri think magic doesn’t exist? Are there more people in the world with gifts like Alizhan’s? And what does any of it have to do with the medusas—giant jellyfish—whose deadly venom is as rare as it is valuable? Not having heard of Thornfruit prior to reading it, I don’t know if it was aimed at a particular audience, but while it’s still enjoyable for adult readers, I’d argue that it’s best described as YA or new adult. Ev and Alizhan are both young women, and the story is told primarily from their third-person perspectives, interspersed with a third, initially anonymous woman’s testimony about her life. There’s an intimacy to their shared narration that serves the story well: Davin’s characters all have distinct voices, and she moves between them with ease. Though there’s some clunkiness to the execution of an early timeskip—the story begins with Ev and Alizhan’s initial meeting in the marketplace, then jumps forward ten years to the present day—the pacing otherwise moves smoothly, making Thornfruit a very readable book. It helps enormously that Davin has created an engaging, original setting for her story. Laalvur is a country on the Dayward side of the world—a place of perpetual sunlight. The Nightward side, by contrast, is perennially dark, confining humanity to a specific meridian of habitable land between the two extremes. Ev and Alizhan live in Arishdenan, a Laalvuri port city with a moderate climate, but Ev’s father comes from the nation of Adappyr, a place so hot that the people all live underground. Time in Laalvur is divided into shifts, with sleep schedules varying according to profession and need. It’s the kind of thoughtful worldbuilding that I really love, so that even when I had the odd nitpicky question, about a throwaway detail or something that was happening in the background, I was never jarred out of the story. Given the scale of the setting, you might easily expect the plot to focus on grand, sweeping politics and world-altering events—and, to a degree, it does. But while the wider implications of Ev and Alizhan’s adventure are certainly great, the bulk of the emotional significance is localised to the girls themselves: to their budding romantic relationship, their struggle to understand Alizhan’s magic and the powers of others like her—and to try and protect them, once it becomes clear that they’re in danger—and their respective places in the world. Of particular significance is Alizhan’s faceblindness: though neurodivergent and autistic are words that don’t appear in the text, either one could easily apply to Alizhan, and it’s a refreshing thing to see such a character rendered so empathetically. The relationship between Alizhan’s magic and her other differences is a fascinating one, and something that Davin executes with care and nuance. Having the ability to read people’s feelings and see their memories doesn’t stop Alizhan being faceblind: even when she’s “seeing” someone in a memory, she can’t describe their facial expressions or physical features. By the same token, her inability to touch people other than Iriyat without causing and experiencing pain leaves her touch-starved; and yet, despite both her mindreading and her desire for connection, she’s still awkward around people, making her personality and experiences that much more plausibly multi-dimensional. Her relationship with Ev is likewise written with care. Though the girls argue at times, struggling to navigate their desires around Alizhan’s inability to touch and the etiquette of her reading Ev’s thoughts, their romance is both convincing and moving. Ev has always felt out of place for her size and has dealt with mockery for her biracial heritage, but Alizhan finds her lovely and strong and good. Alizhan has grown up feeling like a freak and a weapon, but Ev sees her as something beautiful and worthy of protection. The true strength of Thornfruit is in its characterisation, and without wanting to spoil a key reveal of the book, this is particularly well-demonstrated in the first-person writings of the third, unnamed narrator, whose story not only fleshes out details of the wider world, but ultimately proves the key to understanding the events in which Ev and Alizhan are now caught up. 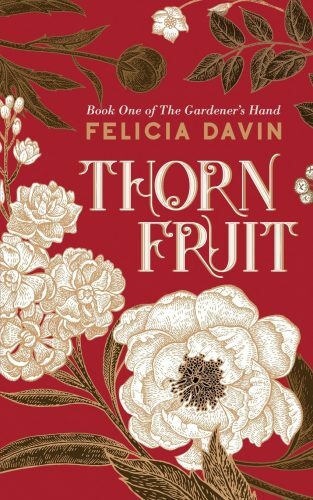 As the first book in a completed trilogy, Thornfruit did a good job of being self-contained while still leaving me curious and eager to find out what happens next. Though there were times I wanted to see more of events than what we were shown through the existing perspectives, I ultimately enjoyed the book, which is well-written, original and diverse, and definitely one I would recommend. A very pleasant surprise, given that I hadn’t previously heard of it; I look forward both to finishing the series, and to seeing what Davin writes next.